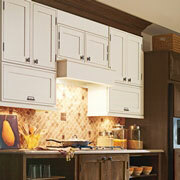 Kitchens are an ever-popular room in any home. They host a dozen or more activities every day and serve as a natural gathering spot for your client’s friends and family. Make this space even more welcoming and pleasant than it already is with the kitchen remodeling products available at ProSource® of Palm Beach. The color, cut, and style of your kitchen cabinets does much to set the overall tone and character of your client’s kitchen. When remodeling a kitchen, many trade pros start with the cabinets, as it allows them to better visualize how the rest of the kitchen’s decor will look. 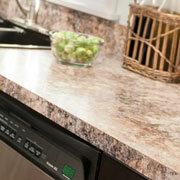 At ProSource, we’re proud to offer custom kitchen cabinets. As part of that customized experience, we help our trade pro partners and their clients pick out matching cabinet hardware. 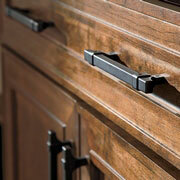 These pulls, knobs, and handles help to tie the visual appearance of your kitchen together. When your homeowner clients ask for a top-to-bottom kitchen remodel, make sure to meet them somewhere in the middle with a brand-new kitchen countertop. We offer modern classics like marble and granite countertops, which have natural coloration that makes them a defining element of a kitchen’s aesthetic. The kitchen sink is one of the hardest working fixtures in any kitchen. 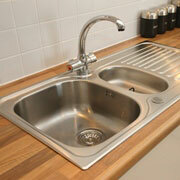 From meal preparation to clean up, the kitchen sink is used regularly. For clients that are amateur chefs, trade pros might consider a stainless steel, triple basin sink. For others who need a subtler option, meet with our designers to find a double or single basin option. 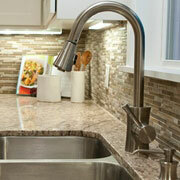 The design of modern kitchen faucets emphasizes both form and function. Easy to use and elegant in appearance, a carefully selected faucet can add to the ambiance of the kitchen and the utilitarian purpose of the sink.